If you don’t know what compost is, I’m sure you have at least some idea. You know it’s good for your garden, you know you should be using it, but how do you go from garbage to greenage? Stuff to put in your container. Periodically moving the stuff in your container around. This can be any number of things. There are commercially available units from about $60 upwards of $300. Even though they work pretty well, they can get expensive. Also, the size is fixed so if you find yourself needing more compost, you have to buy additional units. I’ve always seen people build their own bin. On the expensive side, you can use landscape timber or black locust lumber. Stay away from pressure treated wood. I try to stay towards the cheaper end of things. You can use steel fenceposts and chicken wire, reclaimed pallets or other scrap wood to make your bin. I chose to get a little creative with my construction, and got the whole thing done for less than $25. There’s 2 main ingredients in compost. Carbon is provided from “brown” materials added to the heap, and Nitrogen comes from the “green” materials. Ideally, you want a 30:1 ratio of Carbon to Nitrogen. You might be saying: “But lawn waste and table scraps don’t have their molecular structure listed on the side!” Settle down, people way more into this than I made a handy calculator. Remember to keep your pile damp, but not wet. If you can squeeze water out of a handful like a sponge, it’s too wet. The microorganisms living in the pile will feast on the combination of organic material and water. This will create a good bit of heat. A healthy compost heap can reach up to 120°F due to all the little bastards pigging out in there! Even if you meet all the criteria I just laid out, the pile will take forever to produce compost if you don’t turn it over periodically. See, in addition to the Carbon, Nitrogen, and water, many of the organisms in the pile need an oxygen supply. As they do their germy thing, they will deplete the oxygen level at the center of the pile and begin to die off. This makes the pile loose heat, and slows the reaction even further. Turning the pile will keep things rolling along. Some of the self contained units make this very easy, but a little time with a D-handle fork or front end loader is a small price to pay for healthy veggies! Try to turn the pile once every 2 weeks. You can use compost in several ways to boost the output of your garden. In the Fall you can till it into your beds before you sow any bulbs such as garlic. In the spring, you can prep the rest of the garden by tilling in compost before you plant annuals. You can even add lines of compost to the beds during the growing season in between rows of plants. 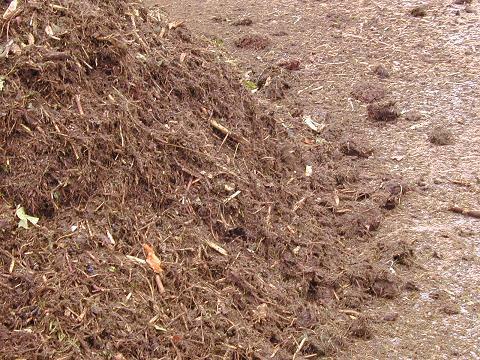 I have even seen people add compost to a spreader and put a thin layer over their lawns after aerating. In any of these cases, you’re going to want to make sure the compost is done decomposing before you use it. If the compost is still “going off” you run the risk of burning the plants. The only times I would use compost that is still decomposing would be to prepare a bed in the fall for next spring, or on a well established fruit tree. Keep an open mind when considering sources of material. The plants in your garden when you take it down at the end of the year, egg shells, and fireplace ash can all be valuable additions to your compost. Make it easy for yourself. Consider getting a small pail for kitchen waste. 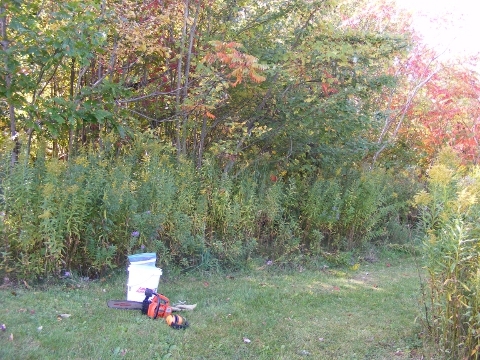 Locate the pile in a convenient space, next to a source of organic material or near the garden. Don’t make a pile with more material than you can handle. Remember, you want to shoot for turning it over every 2 weeks! If you’re running short on material, see if anyone in the neighborhood can help you out. Maybe your neighbor has a stall or coop that needs cleaning out. This entry was posted in Land and tagged compost, garden, green, Herbs, Lawn, organic, recycle, vegetables. Bookmark the permalink.